In the Triceps Push-Down the triceps brachii muscle is involved in elbow joint extension. In this action the forearm moves away from the upper arm, which is held stable, to a fairly straight, upright, arm position. 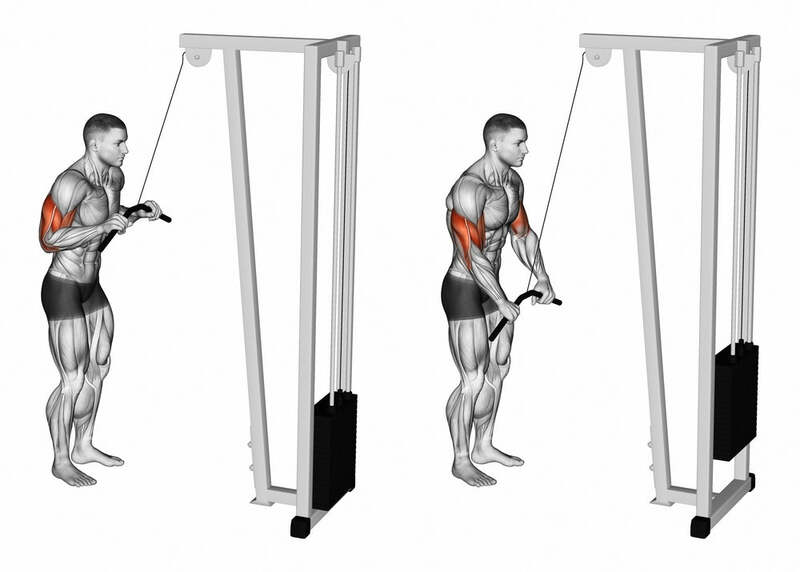 The sports uses are the same as for the triceps overhead press. In addition, the muscle strengthening in this exercise plays a major role in baseball batting (just prior to ball contact) and in the tennis serve, volleyball spike and basketball shooting. It is extremely important in the martial arts (karate, wrestling, and so on) and for boxers and mixed martial artists in punching. This is the action that produces up to one-third of the total force in a punch. Also, elbow extension is the key action for arm quickness in reaching. By incorporating hand pronation near the end of elbow extension when using the rope attachment, you will experience a much stronger contraction than when you use other cable attachments. When you pronate your hand (under resistance), you slightly displace the ulna bone to which the triceps attaches, thereby producing a different angle of pull. This is why you will find the upper head of the triceps kicking in very strongly along with the middle and lateral heads. As an added benefit, you develop the assistant elbow extensors and pronator muscles of the forearm. Also, keep in mind that the wrist extensors (and flexors) remain under a strong isometric contraction to hold the wrist in place.